I don't have a beautiful laundry room. I envy those who have an actual room where you can hide your dirty and clean laundry. I, on the other hand, have a laundry closet. The washer and dryer are hidden behind two doors. No frills. I do have a wired shelf above them for extra storage. One day, I want to update it with another shelf and maybe a cabinet. I even have a Pinterest board for my future Laundry Closet ideas. 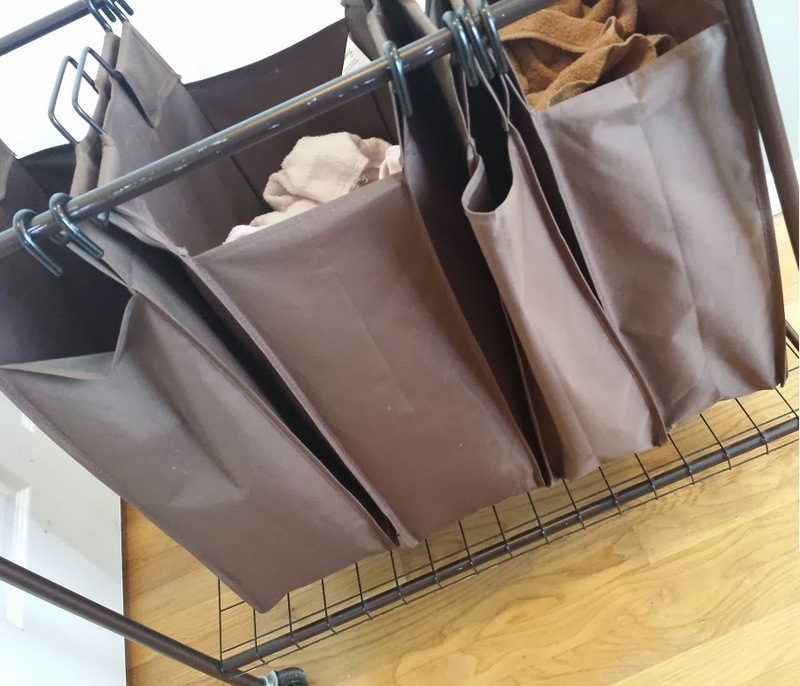 In the meantime, we have two laundry hampers to help sort and hide the clothes neatly. One in our bathroom and one in the kid's hallway. Recently, (actually it's been about 3 months ago) our laundry hamper died. The screws broke that hold it together. Poor thing, there was no hope in repairing it. 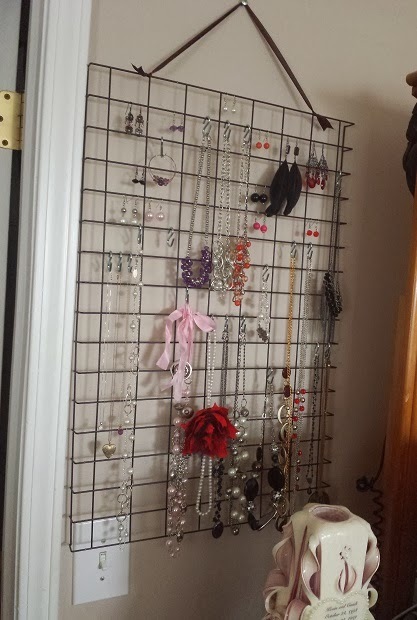 I loved the bottom wire rack and decided to keep it in the bathroom next to the shower. Why next to the shower? I couldn't think of where else to keep it. 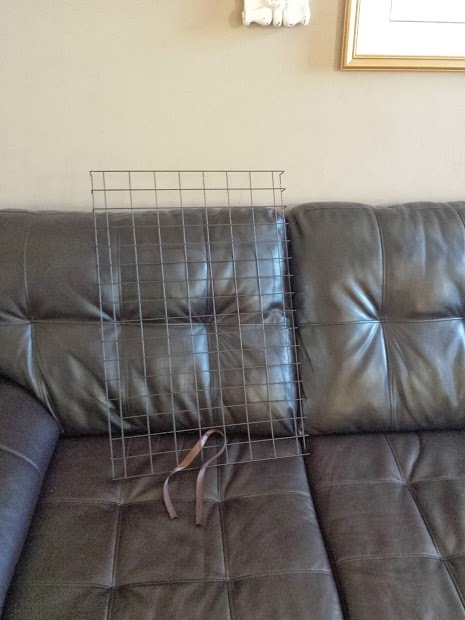 The garage is full of other things for future DIY projects and I didn't want to forget about it by placing it in the black hole a.k.a. garage. My husband ignores my hoarding until it gets out of control. Thankfully, I decided to use it before he decided it was in the way. Initially, I thought about turning it into a burlap wreath like this. But I'd have to cut the wire with a wire cutter and frankly, that seemed a little daunting. 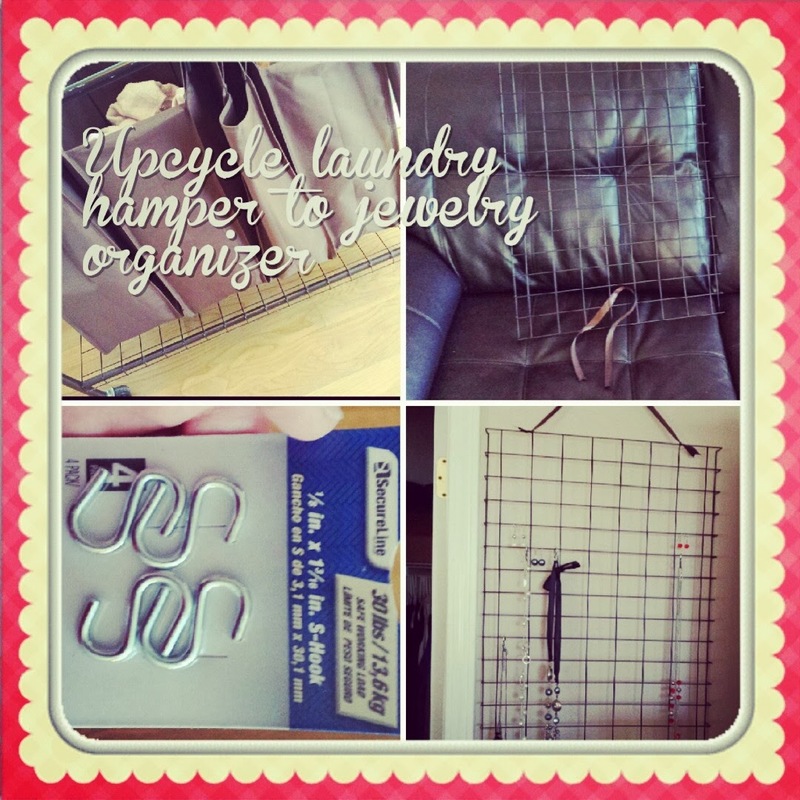 Then I saw this jewelry organizer and thought, bingo! I can use my fancy-schmancy wire rack and hang all my $5 Paparazzi jewelry instead of it cluttering up my dresser. 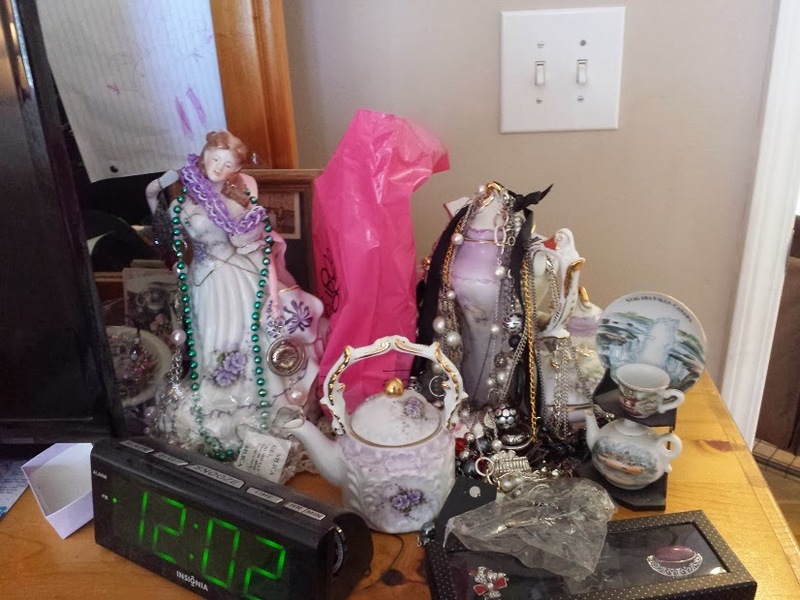 Find a place you like on your wall that would be appropriate for said jewelry organizer. Tie ribbon at the top of the rack to create a hanger. Screw the screw into the wall where you want to hang it. Hang the rack from the ribbon on the screw. 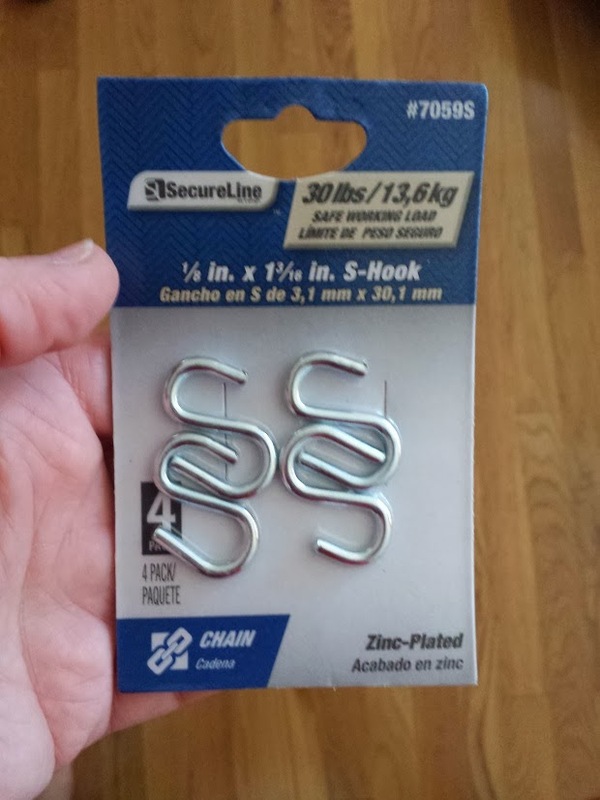 Hang the s-hooks on the rack and hang the necklaces and bracelets on the s-hooks. When you buy Paparazzi necklaces, you receive a free pair of matching fishhook earrings. So I hung all of those on the rack too. It turned out adorable and I am so happy about it. My jewelry is neatly hung up, no worrying about it becoming tangled or mangled. And I can actually see what I have! And my dresser is back to being nice and neat. This makes my hubby happy! What kind of DIY projects are you up to? Visit these linky parties to see how others have been crafty lately!